Raymond Magritte, Brussels, the artist's brother. Arlette Magritte, Brussels, by descent from the above. Anonymous sale, Sotheby's, London, 26 June 1985, lot 224. Anonymous sale, Hauswedell & Nolte, Hamburg, 8 June 1990, lot 50. Acquired from the above by the present owner in 2005. D. Sylvester, ed., René Magritte, Catalogue raisonné, vol. 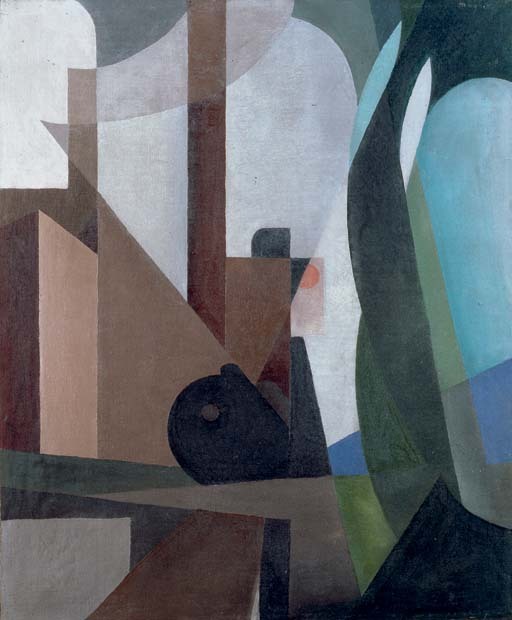 I, Oil Paintings, 1916-1930, Antwerp, 1992, no. 48 (illustrated p. 150). Magritte's accidental discovery of Italian futurism in 1915 exerted an enormous influence on the young artist, still in essence searching for his own means of artistic expression. 'The elements which entered into the composition of my pictures were loosely defined shapes and colours, so that those shapes and colours could be modified according to the demands of a certain dynamic rhythm' (Magritte, 'La ligne de vie', lecture given on 20 November 1938 at the Koninklijk Museum van Schoone Kunsten in Antwerp, reconstructed text quoted in D. Sylvester, ed., René Magritte, Catalogue raisonné, vol. V, Antwerp, 1997, Chron. 38.5.2, p. 17). Under the influence of artists such as Gino Severini, Magritte began a period of intense artistic innovation during the early 1920s. Commenting later on this influence he stated: 'I'm neither a "Surrealist" nor a "Cubist" nor a "Patawhatever", even though I have a fairly strong weakness for the so-called Cubist and Futurist "schools". Were I really an artiste-peintre, I would waver between these two disciplines' (Magritte in a letter to André Bosmans, April 1959). Painted in 1923 the present work perfectly displays this new exploration of colour and form; Magritte has flattened the surface of the painting by juxtaposing planes of colour and has combined the shape of the subject with the surrounding forms that define it. Furthermore Magritte contrasts the angularity of his linear construction with more rounded organic forms, echoing the dynamic rhythms of the Futurists.